A Siberian start to the month, and who knows after that! The cold spell that has been forecast will cause problems. The advice is to be patient - keep off the square if it is frozen or if there is a heavy frost. Rolling and general pre-season maintenance tasks will need to be put on hold. The following advice should be applied once weather conditions are favourable. Regular brushing in the mornings to remove the dew from the playing surfaces will reduce the likelihood of disease outbreak. Check all machinery has been serviced and sharpened ready for use. Give the square a light verti-cut and mow at 15-18mm to encourage sward density. As soon as possible, the square must be "squared off". Carry out renovation to bare areas such as ends and foot holes. Start pre- season rolling if not already done so. Outfields will also need some attention, with a light harrow, mowing at 25mm and aerating. Check sight screens and covers are in good condition. Keep records of work carried out, such as core samples, mowing and rolling. Re-commission your irrigation systems and check you have not had any frost damage. As soon as possible (for all you early birds), the square must be "squared off". By using semi-permanent markings, this operation can be made very simple using the 3, 4, 5 system to produce your right angles. Fixed plastic points pushed into the ground on the four corners are valuable in marking the correct position of the square. These are sunk slightly below the surface to ensure no damage to machinery is incurred. As an addition, a fixed point for the stump line and return crease is also extremely useful. This can provide accurate measurement from stump to stump (22yds). It is advisable to spend time getting your square absolutely correct; it will save time in the future. Continue brushing on a daily basis to remove moisture from the grass surface; this will allow for a much better standard of cut. Light scarification or verticutting can be carried out at fortnightly intervals pre-season. Removing horizontal and stoloniferous growing grasses and surface organic matter is always beneficial for the onset of pitch preparation; together with brushing, this will improve your quality of cut. The mowing height should be lowered to around 15-18mm by the end of the month. Remember not to remove more than 2/3 of total grass height in each cut. The less stress that is placed on the grass at this vital time the better the results further on into the season. Seeding of the ends with a perennial rye grass, where the grass is weak, sparse or bare can be undertaken as the rise in temperature along with sheets will help germination. Remove the sheets regularly to check for diseases. Remember that without good seed to soil contact, the operation is useless. The use of perennial rye grass is ideal for this. With its fineness of leaf, it combines superb close mowing with excellent wear tolerances and high quality aesthetics, is shade tolerant, fast establishing and produces very little thatch. 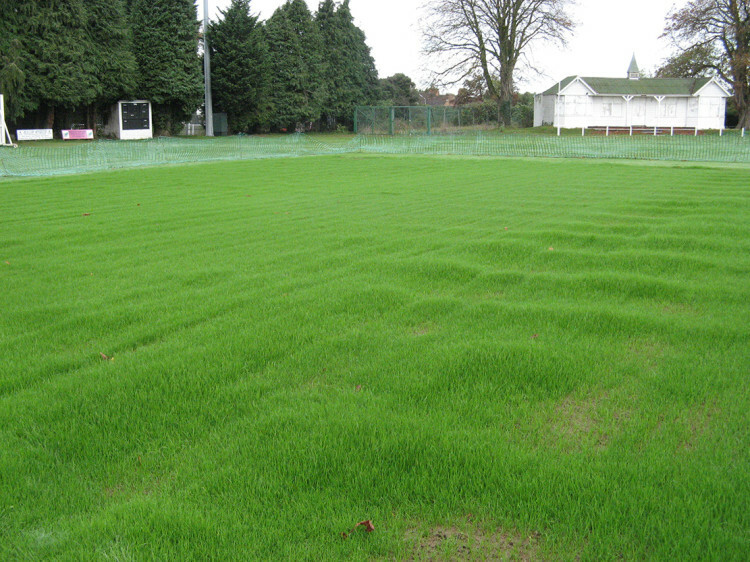 Fertiliser treatment and turf tonic can be continued in accordance with your annual programme. Ideally, get your soil sampled for nutrients, organic matter content and soil pH. This information will help decide on the appropriate course of action with regard to applying the correct NPK balance for your site. If you haven't got a fertiliser programme, then get your soil tested soon. To help kick start the grass into growing, you can begin to apply some low Nitrogen based fertilisers. At the time of writing, the fast moving current of air which races high above us, known as the jet stream, is sitting lower than would be expected. As a result, Ireland lies above its path rather than our typical position above. Consequently, this allows cold arctic air to move in from the north and east, bringing with it low temperatures. The meteorologists estimate that this pattern of weather is likely to extend into the middle of March. Despite all the modern methods we are able to employ to regulate grass plant growth, the one thing we cannot control is the temperature. This means then tricky times for turf managers who would have been hoping for warmer air to raise soil temperatures and, in turn, stimulate recovery growth after the long winter. The good news, of course, is that disease pressure is likely to be low. Managers across all disciplines will be under pressure when it comes to members and players expectation of Spring. Forcing growth in such conditions, however, is simply not feasible nor sensible. The plant and soil biology know what they need and no amount of fertiliser will force them to respond when they are not ready and warm enough. The onset of colder weather is, of course, often accompanied by sunshine, which will provide two benefits on areas which receive direct sunlight. Warming and photosynthesis happen in short lived concentrated blocks of time. Cold night-time temperatures mean the daily base line soil temperature drops as the soil does not build up any warming momentum. The result is patchy and inconsistent growth. A useful analogy is to think of it rather like a cyclist trying to get up to sprinting speed as quickly as possible, when every tenth rotation of the pedals his foot slips off. Nitrate nitrogen – research shows it is absorbed into the leaf over 48 hours where it then resides in the spaces between cells ready and waiting to be assimilated when the plant requests it. Humic Substances – in particular, micronised formulations containing a percentage of Fulvic Acid which acts to pull fertilisers into the plant more efficiently. Carbon – the foundation energy source of plant and soil life; providing carbon increases utilisation efficiency of fertilisers and props up the soil food web. Seaweed – plant stress hormones prime the plant by eliciting metabolic functions which allow it to better withstand environmental (abiotic) and pathogenic (biotic) stress. Calcium – strengthens cell walls, creating a more resilient plant. Micro nutrients – anyone looking to make informed decisions on their soil health will have had a full chemical analysis undertaken. Foliar applications of deficient nutrients in the tank mix will allow you to overcome a lack of supply of the soil, and provide the plant with everything it needs to maximise those concentrated blocks of light energy and warmth. Patience – understand what the plant needs and when; don’t be tempted to plough in nutrient that cannot be consumed. It will either leach into water courses or sit, slowly degrading, forcing a disease susceptible and mower demanding flush when conditions turn warm and wet. Preparation – get a conventional release Ammonium sulphate based granular fertiliser on the shelf, ready to go down as soon as you see and hear the forecasters confidently predicting a consistent upturn in temperatures and available moisture. Preferably one containing a little calcium for cell division and magnesium for chlorophyll production. March is an excellent time to treat moss; however, beware too much sulphate of iron if desiccating winds are prevalent, and most certainly hold back scarifying until strong consistent grass growth is there to repair the sward. March is the time to start applying polymer wetting agents, such that you have enough time for the chemistry to build up in the soil ahead of summer. Prevention is absolutely better than cure when it comes to dry patch, and planning and preparation now prevents poor surfaces later in the year. March is a good time to prevent the effects from type two fair rings in the summer. A combination of aeration, surfactants and azoxystrobin fungicide will allow water and active ingredient to move into hydrophobic regions occupied by the fungal mycelium. All machinery should now have been returned from any servicing in time for use. Ongoing inspection and cleaning of machinery after use is vital. Breakdowns cost money, as well as inconveniencing pitch preparations. The workshop should be kept in a good order; good housekeeping is important, a tidy workshop reflects a tidy worker. Keep a good supply of materials, such as loam and seed at hand for repairs and maintenance. Materials for spring remedial works should be booked to avoid disappointment or delay. Check your sightscreens for damage; many free standing types often get blown over during high winds or, worse still, are stored underneath trees, resulting in green algae forming on the sheeting. Check and repair fences and scoreboards. Organise appropriate repairs or replacements. Covers - are they ready for action, no repairs needed, all in good order? Remember, covers are used a lot in our climate for protecting the playing surface from rain and sun under preparation for play. Covers will be required for use during pre season preparations, make sure they are ready. Allow time for cleaning and repairing. Artificial Pitches - Keep all surfaces clean and safe, by regular sweeping and brushing to remove any algae and moss from surface. 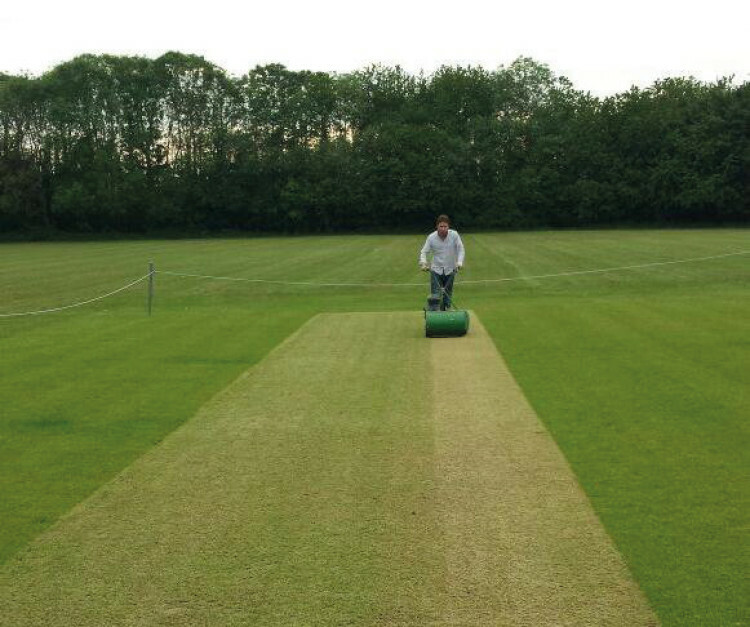 Ensure damaged batting and bowling areas are repaired. Ripped or loose material could cause injury to players and end users. Net Facilities - Replace or repair damaged structures and netting, order new if required. Strim and mow around structures.